Victoria Hawkins, Marketing & Communications Director, Explore Gwinnett. Explore Gwinnett is part of the Gwinnett Visitor and Conventions Bureau. It is their job to tell people where to go, places to eat, things to see and what to do in Gwinnett County. Chef Nicholas St. Clair, Owner of Antebellum. Nationally-renowned and award-winning Antebellum Restaurant in Flowery Branch is on Opentable’s 2016 Top 100 Restaurants in America list (the only in the State of GA to make the list). Buck Lanford, News Anchor, FOX5 Good Day Atlanta. Buck does a segment on the show called “Burgers with Buck” where each week he tries a new burger across metro Atlanta. If this guy doesn’t know burgers, we don’t know who does! Skye Estroff, Marketing & Media Manager, Taste of Atlanta. Taste of Atlanta has been Atlanta’s premier food and beverage festival for sixteen years straight, featuring over 90 local restaurants. This year’s festival is set to take place from October 20-22nd in Historic Fourth Ward Park. Two beef patties stuffed with melting cheese, fire roasted, poblano peppers and bacon.Topped with more cheese, pico guajillo salsa, and chipotle cream. This one has a kick to it! Hand-formed beef patty on Pita Bread with onions, cucumbers, cabbage slaw, tomatoes and white American cheese. ½ lb burger topped with maple pepper bacon, American cheese, Sam Adams Boston Lager® caramelized onion relish, burger sauce, leaf lettuce and ripe tomato. Lightly blackened and topped with crisp bacon, pepper-jack cheese, onion straws, and Buffalo’s Vidalia Onion Sauce. Meat was well seasoned. The bacon was perfectly crisped. This “special” is now on the menu year round. Your choice of a 100% beef or lean bison patty topped with American cheese, a homemade zesty barbecue sauce, golden onion rings, fresh lettuce and ripe tomato. Great presentation! I liked the sweetness of the sauce and the crispy onion rings on top! A double burger topped with Pepperjack cheese, jalapeños, pepperoni and Sriracha mayo, all on a Brioche bun. Good ratio of meat to toppings. A ½ lb, 100% fresh Angus beef burger, molded in-house with all house-made seasonings and toppings, including pimento cheese spread, candied jalapeños, and Cajun-seasoned bacon, all served on a potato bun. Love the sweet and spicy combo with the candied jalapeños! Lucky Dog is a hidden gem located on Buford Hwy, just south of McGinnis Ferry Rd. 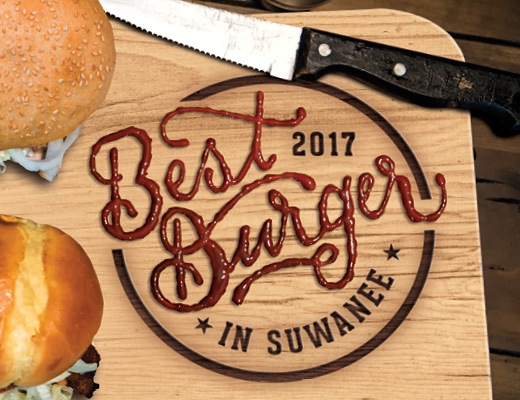 They initially opened four years ago as a Chicago style hot dog eatery but are now under new ownership and while staying true to those Chicago roots, have expanded the menu to include…well, things like Suwanee Magazine’s Best Burger in Suwanee!! The official name of this burger is The Cowboy Burger: a double patty smothered in American cheese, BBQ sauce, bacon, onion rings and a house-made chipotle aioli all on a toasted brioche bun! A very nice blend. Would definitely order again! Interesting burger, I liked the touch of sweetness. Very saucy, which is a plus for me. Two beef patties, horseradish sauce, Maker’s Mark® bourbon and cola onions, crispy bacon, blue cheese crumbles, arugula and Hickory Honey BBQ sauce, all stacked on a toasted onion bun. I like how the sweet, caramelized onions balance out the tartness of the blue cheese. I was pleasantly surprised by how delicious this burger was! I’m usually not a fan of blue cheese, but this was great. The caramelized base was deliciously smoky and the cheese wasn’t too overpowering. Watch the video to see how the contest happened.